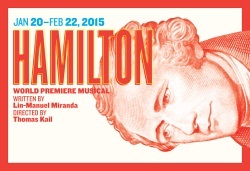 The Public Theater are to present the world premiere of Tony and Grammy Award-winning composer and lyricist Lin-Manuel Miranda’s Hamilton, playing at the Public’s Astor Place from 20 Jan – 22 Feb 2015. Inspired by Ron Chernowthe’s biography of Alexander Hamilton, which traces the life of Hamilton, an illegitimate, largely self-taught orphan from the Caribbean who rose to become George Washington’s aide-de-camp and the first Treasury Secretary of the United States. The musical features a cast of historical figures that includes George Washington, Aaron Burr, James Madison, and Thomas Jefferson. Hamilton will be directed by Thomas Kail, who collaborated with Miranda on the Tony and Grammy Award winning musical ‘In The Heights,’ and will feature Miranda starring as ‘Alexander Hamilton’. The musical is being produced by The Public with the support of Jeffrey Seller, Sander Jacobs, and Jill Furman. 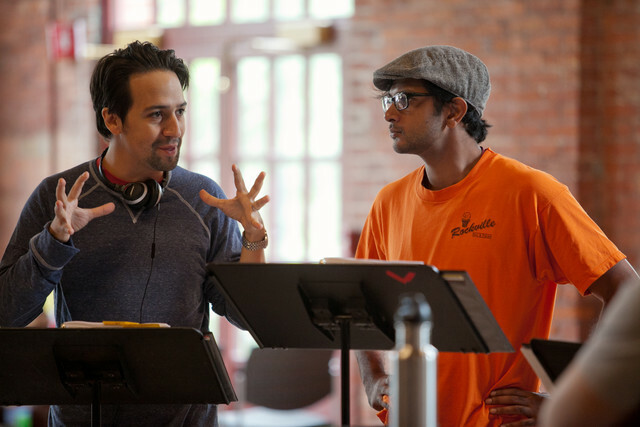 The musical-in-development was the subject of a workshop at Vassar College last summer. Here is an earlier report on that workshop which gives us a sense of the scope of the musical. The results have some of Broadway’s top players salivating. Many of them journeyed 75 miles north last weekend to Vassar College, where Miranda’s “Hamilton Mixtape,” directed by Thomas Kail, got a showcase at New York Stage and Film, an incubator for Broadway-bound plays and musicals. “It was terrific,” said veteran producer Margo Lion (“Hairspray”), who was shepherding another show in the Vassar lineup. Miranda, who co-wrote and starred in the Tony Award-winning “Heights,” employed his signature rapping and percussion to hip hop, jazz and musical-theater songs. The piece is sung-through, or sung-and-rapped-through, with little dialogue, people who saw it said. As he had during an earlier preview last year at Lincoln Center’s American Songbook series, Miranda played the title role. Hamilton (not unlike Usnavi, a character in “In the Heights”) was born on the island of Nevis in the Caribbean to unmarried parents, circa 1755. The family moved to St. Croix, where his parents split and his mother died, leaving him on his own. As a teenager, he clerked for a merchant and moved to New York to study at what’s now Columbia University. Hamilton “embodies hip hop,” Miranda said at the White House in 2009 before performing a mesmerizing solo number from “Mixtape” before an audience that included President Barack Obama and his wife, Michelle. “Mixtape” may do what another show, “Bloody Bloody Andrew Jackson,” couldn’t: Take an American-history theme, set it to music and sell it to Broadway’s mainstream audience. “Bloody” had a critically acclaimed run at the Public Theater but flopped uptown. New York Stage and Film also hosted the debut of what’s currently titled “A Musical Inspired by the Brooklyn Superhero Supply Co.,” co-produced by Amanda Lipitz and Margo Lion. Michael Mayer directed a cast and crew sprinkled with alumni of “Spring Awakening,” the groundbreaking hit he staged in 2006. In this new musical in development, Matt Doyle played a hardware store clerk with a talent for science who develops “Brooklynite” (think Kryptonite) with the aim of taking flight and joining the superhero ranks. Peter Lerman wrote the pop score and Simon Rich the book, based on characters created by married writers Michael Chabon and Ayelet Waldman. It’s filled with jokes about subway lines and neighborhoods that may appeal to Brooklyn insiders and outsiders alike. Steven Hoggett, an in-demand British choreographer (“Once,” “American Idiot”), conveyed the heroes’ super powers with subtle comic flourishes. The Brooklyn Superhero Supply Co. is a real-life store stocked with capes and other accessories. In the back is a free tutoring center, where volunteers help kids with their writing. Muse highlights include movies and New York Weekend. ← FIlm Director Jonathan Demme selling vast art collection in Pa.